Gediminas Avenue (Lithuanian: Gedimino prospektas) is the main street of Vilnius, where most of the governmental institutions of Lithuania are concentrated, including the government, parliament, Constitutional Court and ministries. 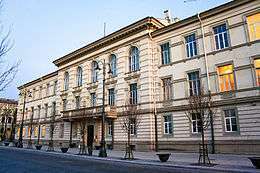 It is also the place of cultural institutions such as Lithuanian National Drama Theatre, Bank of Lithuania, Lithuanian Academy of Music and Theatre and Martynas Mažvydas National Library Nowadays it is also a popular shopping and dining street. 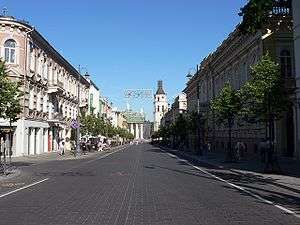 It is partially a pedestrian street in the evenings when the traffic is prohibited. Named after the Grand Duke of Lithuania Gediminas, the street terminates at the Žvėrynas Bridge over the Neris River near Seimas Palace on one end and at the Cathedral Square and Vilnius Castle Complex on the other, passing the Lukiškės Square. It connects the Old Town with Žvėrynas. The street, built in 1836, was initially known as St. George Avenue, Mickiewicz Street (Polish: ulica Mickiewicza), when Vilnius was under Polish rule (1922–1939) and Adolf Hitler Street during the Nazi Germany occupation. At the beginning of the Soviet occupation in 1940 it was called Stalin Avenue, later renamed Lenin Avenue. The avenue carries its present name from 1939 to 1940 and since 1989. A portion of the avenue from the Vilnius Cathedral to Vincas Kudirka Square was thoroughly reconstructed before the celebration of 750th anniversary of Mindaugas' coronation in 2003. The reconstructions included building an underground parking facility – the first such in Lithuania - under the Municipality Square and renovation of all kinds of pipelines and communication cables under the street. Over 100 new trees were planted. During the excavations a few archaeological findings were found and are now on display in the parking garage. The reconstruction continues to other sections of the avenue and was completed in 2009. Wikimedia Commons has media related to Gediminas Avenue.